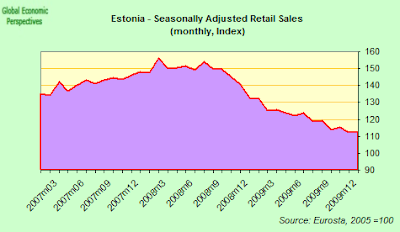 Hard on the heals of yesterday's Latvian GDP numbers we now have news that Estonia’s economy shrank at the slowest annual pace in a year at the end of 2009 as a modest recovery in exports and one-time stock-building helped offset the impact of the continuing decline in consumer spending. In fact gross domestic product fell 9.4 percent, which compares with a 15.6 percent drop in the third quarter, and a 16.1 percent decline in the second one. So the recession is evidently easing. Indeed, startling as it may sound, the economy even grew during the quarter - by a seasonally adjusted 2.6 percent when compared with the third quarter. 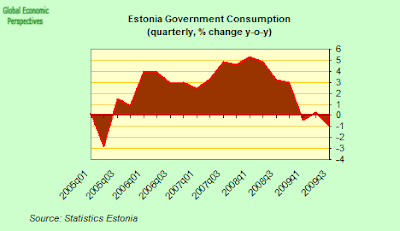 The news caused some surprise as even the Estonian Finance Ministry had been expecting worse results - an annual contraction of something in the region of 11 to 12 percent. The critical little detail is that the numbers were skewed, since they were affected by a one-off stock- building effect, according to the Finance Ministry, since companies built up their inventories in anticipation of a January tax increase on tobacco, alcohol and motor fuels. As the ministry also added, economic growth will thus see a “negative effect” in the first quarter of 2010 as inventories will inevitably be run down again. "The alcohol, tobacco and motor fuel excises were applied in the beginning of the year, so the stocks of those products were increased, and that gave a positive move to the GDP in the fourth quarter, but will give a negative influence in the beginning of this year,” according to Andrus Sääsk Head of Macroeconomy at the Ministry of Finance. 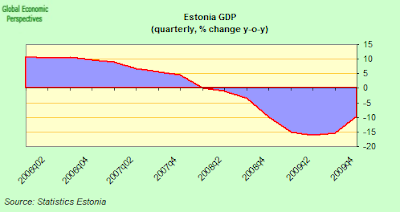 So, as we are seeing in the other Baltic States, the recession is gradually winding down, but there is no end to the agony in sight, since structural distortions in the economies produced by the earlier boom will impede any immediate recovery. If we look at retail sales the pattern is similar to what we are seeing elsewhere, and these are now down about 28% from their February 2008 peak. A similar situation is to be observed in industrial output, which fell back again in December (by a seasonally adjusted 2.2% from November) according to statistics office data. 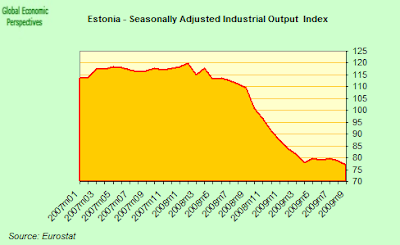 Industrial output is now down 32.5% from the February 2008 peak. And while exports have picked up slightly from the first quarter 2009 trough, momentum has not been strong enough yet to reverse the deadweight drag of domestic consumption. 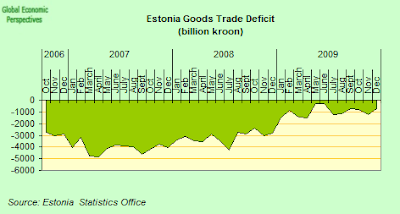 The goods trade deficit has improved - indeed the 2009 deficit was the smallest since 1995 - but it is still a deficit, although the country does run a healthy services balance. 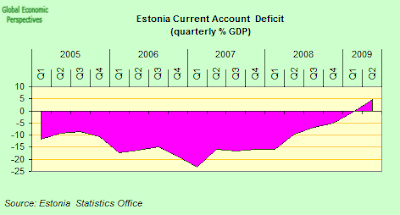 And the services balance is what makes the difference in turning the current account deficit into a surplus. On the other hand unemployment continues to rise, and is the third highest in the European Union (after Latvia and Spain), hitting 15.2% in September - which is the last month for which the Eurostat has data at this point. 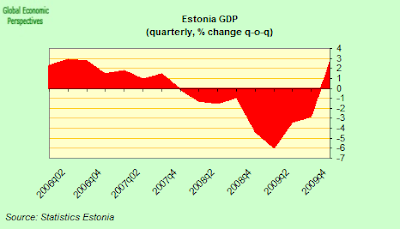 Indeed statistics regularity and quality is one of the issues which Estonia will need to attend to as part of its general euro ambitions, as the ECB took the trouble to point out recently. 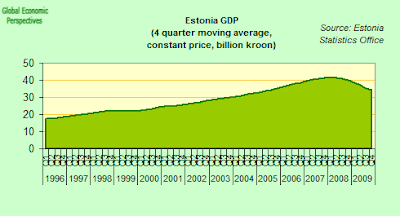 Estonia's population fell again in 2009 - by 400 - and was estimated by the statistics office to be in the region of 1,340,000 at the end of the year. 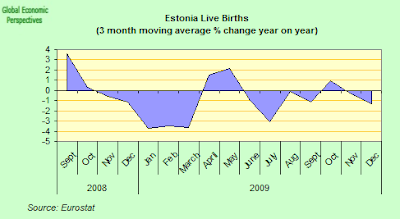 A falling death rate meant the population decline slowed down over the year, but the number of live births decreased for the first time in eight years (see chart below), raising issues about the longer term impact of the crisis. Some 15,807 live births were registered in total in 2009 - 221 birth less than in 2008. 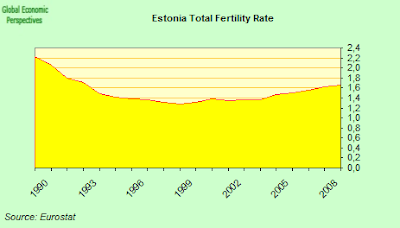 While the situation is a lot less serious than the one Latvia faces, the downturn in Estonian births is a rather bitter blow for a country where fertility had rebounded substantially from earlier lows, and while the 1.6Tfr was still a long way from population replacement level, the improvement had been a welcome one. 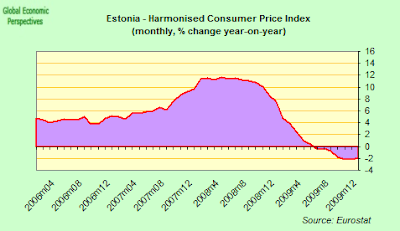 Estonia's credit rating outlook was raised this week by Standard & Poor’s, from negative to stable. More than the improvement, what is interesting is the reason given, since the agency cited improving prospects for euro adoption next year. This has both a positive and a negative reading. 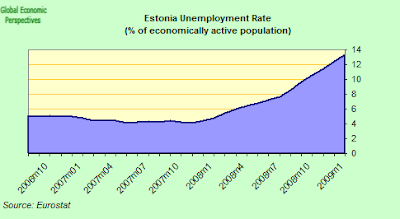 The positive reading is that S&Ps think Estonia will meet the eurozone membership criteria. The negative one is that the improvement is not due to any underlying change in the country's growth prospects, which are at the end of the day the main area of immediate concern. Indeed S&Ps have an A- rating, the fourth-lowest investment grade, on Estonia and the move to stable from negative, means the rating is more likely to be left unchanged than raised or lowered. The rating was in fact cut from A last August, and evidently losing the A- rating would give a rather negative signal given that the ECB is about to return to at least one A- as the minimum collateral condition. Fitch currently has a BBB+ rating on Estonia, and the outlook on this was also raised to stable from negative on February 5. 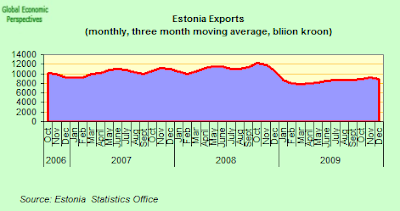 Moody’s Investors Service has an A1 rating on Estonia with a negative outlook. Euro adoption terms require countries to maintain fiscal deficits below 3 percent of GDP, limit debt to 60 percent of GDP and ensure inflation isn’t more than 1.5 percentage points above the Eurozone average, and Estonia has met all the criteria, according to Prime Minister Ansip speaking yesterday. Whether Ansip's optimism is totally justified or not the EU Commission and the European Central Bank will publish their report assessing Estonia’s readiness to join sometime in May, and (assuming this is favourable) the Ecofin council of EU finance ministers will take the critical decision on entry on June 8. The first point is an important one I think. If we go back to the 172 page EU Commission document leaked to the German magazine Der Spiegel last month, the EU Stability and Growth Pact is increasingly going to focus on issues surrounding competitiveness as well as on fiscal deficit ones. That is what the whole deabate over the Greek and Spanish economies which EU leaders are engaging in this week is all about. And any country which is not considered to be in completely good health under the SGP criteria is hardly likely to get the green light from the ECB and Ecofin. 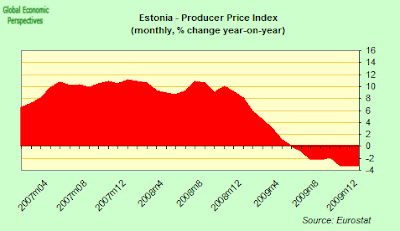 The producer price index has also not moved as far and as fast as will be needed, since it was only down some 3% on the year. So the sad truth is that, whether from inside or outside the eurozone, despite some extensive and painful sacrifices made in not having government spending to fall back on during an extraordinarily deep recession - but then, as Krugman would say, Estonia's problems were never fiscal ones anyway, they were always competitiveness ones - there is still a long hard road out there in front. Whatever the advantages and disadvantages of the chosen path one thing is for sure, it will be absolutely impossible for the country to leave the job half done.